Legal aptitude can be a very interesting subject. It is truly meant to check one's aptitude for law. The aim of this article is to give you legal aptitude related tips. But before that, we will look at the weightage of legal reasoning or legal aptitude section in three main law entrances CLAT, AILET and DU LLB. This article is important from the point of view of CLAT Preparation. These are the first type of questions and most essential so some tips on the same are given in the subsequent paragraphs. The following DU LLB preparation tips for legal aptitude can be applied as it is to CLAT preparation. (a) These questions need the application of legal principles to facts wherein you just need logical reasoning. A logical reasoning question based on law becomes legal reasoning. You need not know anything here. Just take the principle as it is and apply that to the fact. If you feel two or three options seem correct then read the principle again, and mark the choice which seems most correct. (b) The second rule does not assume anything as the law applies hard and fast. This will not be given in any CLAT preparation books or AILET preparation books but it is a winning tip. (c)Third of all even if you know that the given principle is wrong or not as per the actual legal principle in real life even then for the purpose of the question the legal principle given in the question is correct. So, ignore what you know and apply the principle believing it to be true. (e) Do not forget to read the principle again and again if need be. Look for determinants such as "or", "until", " and "only if"
(a) Legal facts are important and for these, you will need to prepare for Indian Penal Code, Torts and Contracts. You also need to know landmark judgments and amendments that recently took place. Knowing fundamental rights, duties, the preamble, and recommendations and chairpersons of various law commissions is important from the point of view of the exam. The important DU LLB preparation tip for legal facts is to prepare for them as GK and along with GK if required. (b)Legal facts or GK also includes the roles and responsibility of the Parliament, powers of all courts, and role and powers of the United Nations along with roles of UN bodies, the ranking of India in development indices, and the top and lowest ranked countries of these indices. In legal GK what is also important is knowing how many Chief Justices has India seen so far, proponents of theories of law, basics of jurisprudence, the origin of law, law and morality, the special status of J&K, and theories of punishment. (a) Legal maxims are also important. These have a trick too. If the term is amicus curiae. Then amicus stands for friend and curiae stands for court. If you remember these 2 meanings then you can answer all questions wherein one of these words is used. So, each meaning makes you win multiple questions. (a) Past year papers and mocks come to aid in a big way in this section as questions are often repeated from these sources with only names changed. V. The best way to go about this section is going through the Universal's LLB entrance guide or your coaching institute material. These are all the CLAT preparation books you need. No use of buying a heavy load of study material and letting it pile up. One book is enough. These are also enough as AILET preparation books. It is a scoring section for those who get the trick behind legal principle based questions, those who have the knack for legal maxims, and legal terms and it is important as a section because in all exams it is this section that is used as a tiebreaker. 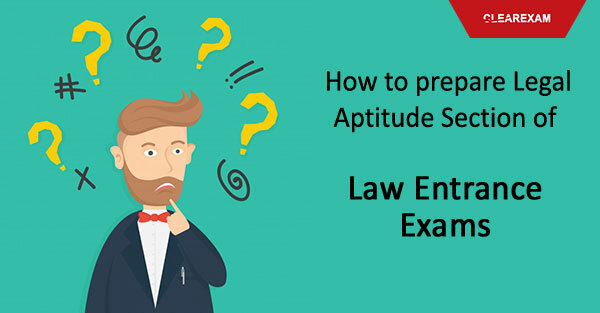 Read the toppers tips on how to prepare Legal Aptitude for Law Entrance Exam. Check Legal Aptitude Preparation Tips here.